EL SEGUNDO, Calif. -- The first long summer for the Los Angeles Kings in six years could best be described as sobering. The Kings missed the Stanley Cup Playoffs for the first time since 2009 and key members of their two Cup-winning teams left the organization during the offseason. The Kings will now try to use the extra rest to rev up again and return to the postseason. The addition of left wing Milan Lucic is the most intriguing topic after the Kings lost right wing Justin Williams and centers Jarret Stoll and Mike Richards. Lucic started camp on a line with center Anze Kopitar and Marian Gaborik, who is moving to right wing, and they have looked like a force. "We think it's a good fit and [will] let it play out," Kings coach Darryl Sutter said. "That's why we're scrimmaging early in camp, and that's why guys are going to play a lot of exhibition games." 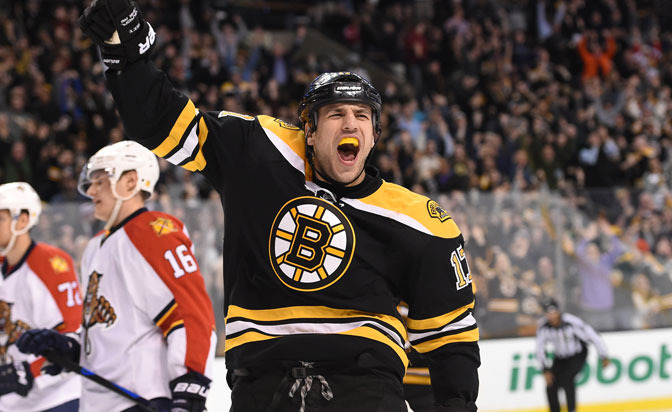 Lucic is a power forward who should fit in with the Kings, who need scoring from the left side. Lucic is coming off a down season statistically (18 goals, 26 assists in 81 games), but his former team, the Boston Bruins, didn't score a lot, and neither did the Kings (218 goals in 2014-15, 18th in NHL). Lucic should get plenty of opportunity on the top line. "The first reaction [to the trade] was that obviously he's a big, strong man,” Kopitar said of Lucic. "My first thought was that he's going to fit really well in our system because we do play that big and physical game. If you look at him on the ice, that's what he stands for." The Kings can reunite the second line of Tanner Pearson, Jeff Carter and Tyler Toffoli after Pearson missed the final four months of the season because of a broken leg. Pearson pronounced himself ready in camp and noted the slumps that he and Toffoli tend to have; Pearson twice went 11 games without a goal and Toffoli had goal droughts of nine and 10 games. "I think we want to keep it going the full year, hopefully playing out here [together] again," Pearson said. "Getting the consistency back and being a part of each other again will be good and help the chemistry out." Captain Dustin Brown and Trevor Lewis lead the bottom six, if only by default, but the depth drops off some because Nick Shore and Andy Andreoff are unproven as NHL regulars. Dwight King, Jordan Nolan and Kyle Clifford round out a group that has been part of two Cup-winning teams, but rookies such as Jordan Weal could emerge. Lucic and Kopitar each is entering the final season of his contract. It could be a distraction if their situations linger deep into the season. One of the top priorities for the Kings is reducing the workload of Drew Doughty, who led the NHL in total minutes played last season (2,377:40). Doughty, who arrived at training camp leaner, said that's the plan. "For the most part, I think my minutes are going to come down," said Doughty, who was second in the League with an average ice time of 28:59 per game. "I'll probably be in that 24-25 [minutes] area, which I know the team thinks is better for me, just because I'll have more energy shift-by-shift … my endurance is probably one of the best parts of my physical abilities. I've always had really good endurance, so I definitely tried to make it better this summer." Christian Ehrhoff, who signed a one-year contract Sept. 4, should provide reliable minutes and some offense. Ehrhoff has 24 career game-winning goals, sixth among active NHL defensemen. He also has 34 points in 73 playoff games. The Kings collectively need to make up for the losses of Robyn Regehr, Andrej Sekera and Slava Voynov. Jake Muzzin continued to make strides last season, and Alec Martinez and Matt Greene are veteran mainstays. Brayden McNabb, Jamie McBain and Jeff Schultz fill out the back end, but there is an opening for rookie Derek Forbort. Despite injuries last season, the Kings allowed 27.0 shots on goal per game, fewest in the League. Jonathan Quick arrived at camp noticeably thinner after an extended offseason. "It's the same routine I usually do," he said. "You just get two more months to do it. Hopefully that pays off throughout the course of the season." The Kings hope so too. Quick tied his NHL career high with 72 games last season because Sutter leaned on him even more than usual in their push to make the playoffs. A better start will go a long way toward keeping Quick sharp in the long run. It was a testament to Quick that he had the sixth-lowest goals-against average (2.24) among goalies to play at least 25 games and was tied for fourth with six shutouts behind an injury-depleted defense. Shootouts, though, remain an issue for Quick, who was 2-7. Jhonas Enroth replaces Martin Jones as the backup, a role he is familiar with after playing behind Ryan Miller with the Buffalo Sabres. The power play was a bright spot as it improved from 27th in 2013-14 to tied for 11th last season (19.0 percent), mostly because of Carter and Gaborik, who combined for 21 power-play goals. Kopitar led the Kings with 24 power-play points. The Kings had two five-game streaks without a power-play goal but were otherwise consistent. It is difficult to believe, but Doughty had one power-play goal, the fewest of his NHL career. Lucic and Ehrhoff are coming off down seasons on the power play, but each has a history of producing. The penalty kill long has been a backbone for the Kings, but it fell from 11th in 2013-14 to 16th last season (80.9 percent). Doughty led the Kings with an average of 2:38 shorthanded ice time per game. Regehr, who retired, was next at 2:35 per game, followed by Greene at 1:59. Toffoli led the NHL with five shorthanded goals, and the Kings should be back in the top half of penalty-killing as long as Quick is in goal. It will be interesting to see how Sutter can get his team to respond, especially after the first significant roster changes since he arrived in December 2011. "We haven't had much turnover since I've been here, when you look at it," Sutter said. "The team has stayed pretty much intact other than one or two players. This would be the first year that there is a four-, five-, six-player change." It's also fair to wonder if Sutter's message is getting stale. But his track record and methods speak for themselves. He remains an underrated tactician who finds chemistry and knows how to prod his players.